Rihanna never stops working. The gorgeous Bajan entrepreneur is making headlines every single day with her new releases and expansions. 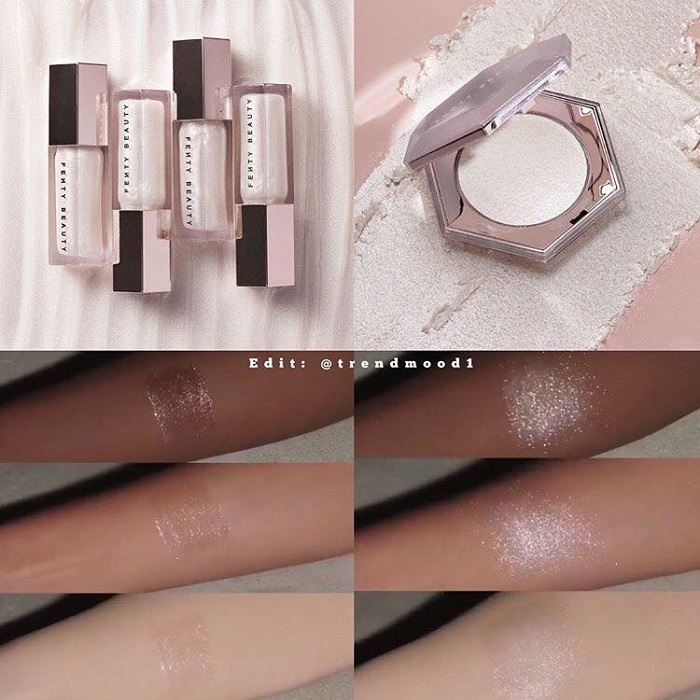 The latest from her makeup brand Fenty Beauty is a special drop for the label’s first birthday. No one throws a party quite like RiRi, so we can already assume how amazing this collection will be. Get ready to add some serious diamond glow to your lips, face, and body. These will become your favorite winter goodies to play with, without a doubt. Just like many times before, the beauty guru used her Instagram account to tease the products. Only one day after the subtle hints, Fenty Beauty revealed the two drops. The first super-exciting thing is a blinding glittery shade of the Gloss Bomb called Diamond Milk. It is exactly what it sounds like, a very rich, pigmented, nourishing gloss for a statement pout. “The lipgloss that made you fall in love, in a brand new shade! #DIAMONDMILK #GLOSSBOMB is a shimmery wash of pearl that’s like a dewy highlight for your lips! And you KNOW it has the same, ultra-nourishing feel of our original gloss bomb, just now in a whole new milky pearl shade.”- Fenty shared on Insta. When it feels as good as it looks! The #DIAMONDMILK #GLOSSBOMB has the same shea butter conditioning formula, with an amazing peach-vanilla scent. Rock this dewy highlight for your lips on its own or pair it with your favorite lip color! Get it on September 7 at fentybeauty.com, @sephora, @harveynichols, and #SephorainJCP! The top-selling Body Lava is now getting a brand new winter version. 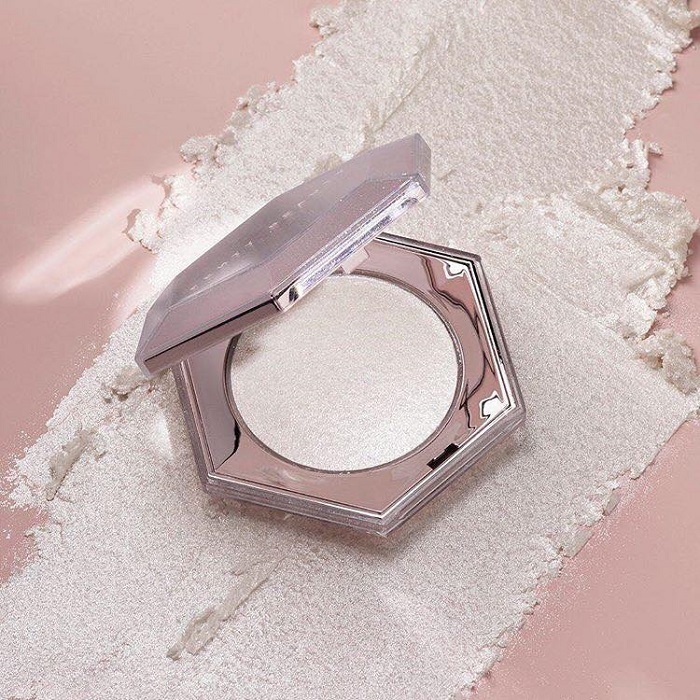 Diamond Bomb is the latest sparkly addition to Fenty’s range, equally mesmerizing as the two previous shades. This shimmery body and face goodie is everything you need once the colder days hit. 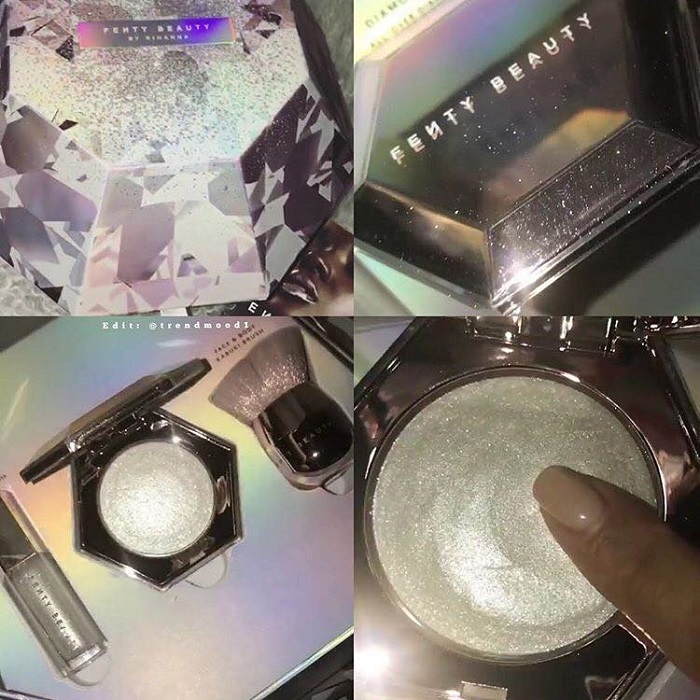 The highlighter features a mesmerizing iridescent shine, in a very unique shade. If you are tired of all the gold and rose gold products, the Diamond Bomb will be a true refreshment in your makeup kit. “This show-stopping, crystal-coated sparkle is a jelly-powder formula melts into your skin like butter and will have you looking like you’re dripping in diamonds. 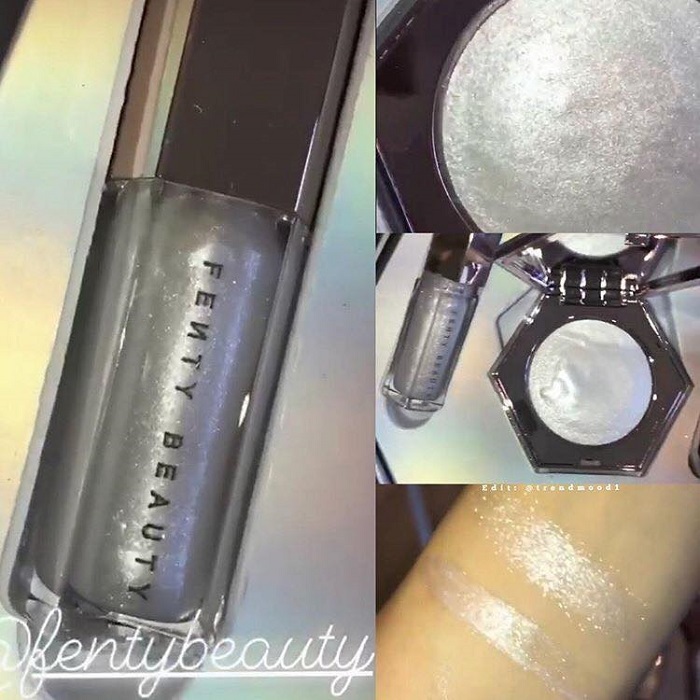 It gives you a colorless, ultra sparkly sheen that looks beautiful applied as a highlighter on the face or on the body.”- says Fenty’s official post. This is how we bathe in diamonds! #DIAMONDBOMB is a colorless, diamond-dusted sparkle that can be applied underneath your foundation for a more subtle glow or on top for a crystal-coated pop! This jelly-to-powder formula is fun to touch and melts effortlessly into the skin. Shine bright on September 7th when you get yours from fentybeauty.com, @sephora, @harveynichols. and #SephorainJCP! The trend of blinding, shimmery, glittery and highlighting products is not slowing down. Instead, it’s transitioning to the upcoming season, when, from what it seems we’ll be obsessed with pearly shades. The two diamond-inspired birthday products will hit the shelves on September 7. Head to fentybeauty.com and be the first one to score them. You can also shop them at Sephora, Harvey Nichols, and Sephora at JC Penney. Use the following days to save up and glow like a real goddess thanks to RiRi.